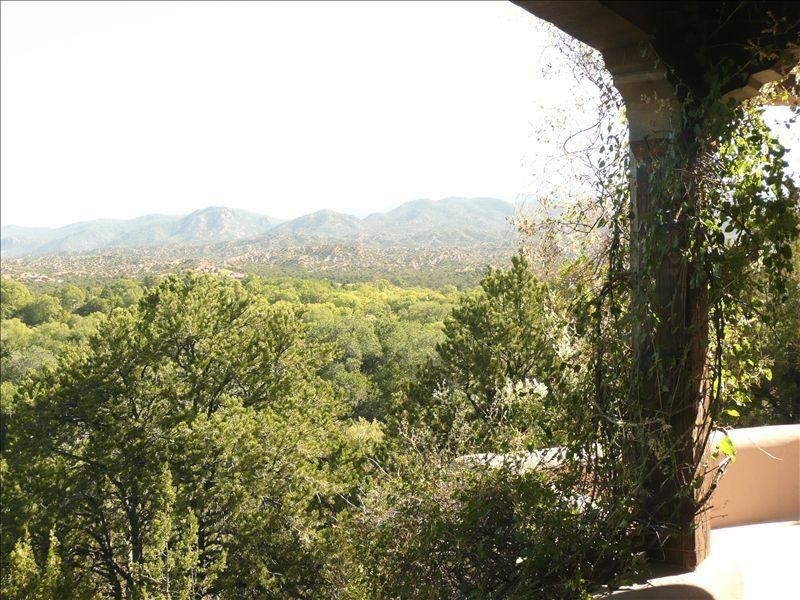 Only five minutes from downtown Santa Fe, yet undisturbed from any city noises, the Tesuque Hill guesthouse shares two and a half acres of land and stonewalled gardens with the owners’ home. It is a separate cottage with spectacular views of the Tesuque valley and the Sangre de Cristo Mountains. A private stone patio with fireplace on the view side and a covered porch on the garden side surround the entire house so you may take full advantage of the beautiful views or the pleasant shade of the garden. In the spring, summer, and fall, the intimate glow reflected off the sunlit Sangre de Cristo mountains lights the lush green valley. In the winter, after a snowfall, the valley's bright pristine snowscapes are dazzling. Your guesthouse is a Santa Fe style home with vigas, wooden ceilings, and tile floors throughout. It is decorated with exquisite ethnographic art. Inside the house you find a spacious fully equipped kitchen and dining area with a French door to the patio and a comfortable living room with a fireplace and large view windows. The bedroom has a queen bed and a French door opens to your private patio. You may enjoy the views even from the bathroom, which has a large tiled bathtub and a separate shower. In the living room a queen sofa bed can sleep two additional guests. Built-in closets offer plenty of space for your belongings. The home is within comfortable walking distance of the famous Tesuque Village Market, El Nido, Shidoni Foundation and sculpture garden, and the Windsor Trail. It is only minutes away from the Santa Fe Opera and the historic Santa Fe Plaza. The owner, William Siegal, loves meeting people from all over the world and sharing tips to discover the unique attractions of Santa Fe and Northern New Mexico. Keywords: Tesuque Hill Guesthouse, separate cottage, Southwestern Style. Bill Siegal, the owner of the renowned William Siegal Gallery and of the Tesuque Hill Guesthouse has lived in Santa Fe for over 25 years. He loves Northern New Mexico and enjoys sharing his guesthouse and his intimate knowledge of the region with guests from all over the world. Gabrielle Viethen manages the reservations for the guesthouse and will respond to your questions reservation requests. Very private and quiet country setting minutes from downtown. Secluded hiking and running trail right from the house. We especially love the unique views and light our home offers of the Tesuque valley and the Sangre De Cristo Mountains. We enjoy making these pleasures available to our guests. Our guesthouse is decorated with rare textiles and objects from pre-Columbian, Asian, and African cultures from the William Siegal Gallery. Elegant rural setting only six minutes from downtown Santa Fe and Plaza. Tesuque is a beautiful village only six minutes from downtown Santa Fe in a lush valley. Patio and view windows from kitchen, dining/living areas/ bedroom. Inside and outside fireplace. Large bathroom with separate shower and bathtub and large window with view. The guesthouse was lovely and very comfortable with terrific views. It was so quiet and peaceful, but we could be in downtown Santa Fe in minutes. We also appreciated the fenced in area right below the patio where our dog could stretch her legs. We spent the holidays in the house in Tesuque. Tesuque is located in-between downtown Santa Fe and and near several little towns further north towards Taos. We wanted to stay in a peaceful place surrounded by nature and we were not disappointed. We chose to stay in Tesuque during the winter time where we experienced a couple of snow storms. We remained warm and cozy with use of both the fireplace and the heating system and watched the snow fall through the living room picture window. The views from all rooms were gorgeous. The kitchen was stocked with everything we needed for cooking. William was attentive to our questions and even provided us with a very nice bottle of wine. We visited the little town of Chimayo further north where visited the wonderful weavers at the Centinela Traditional Arts and also visited the Oviedo Carving and Bronze Gallery where you can speak to both Patricia Oviedo and her husband master bronze sculptor Marco Oviedo who is inspired by New Mexico themes of nature and spirituality. It was a great trip and hopefully we can return to stay in the fall during the Indian Market. Thank you William for letting us stay in your beautiful casita. So happy it all worked out for you. Thanks for the kind words and hope to see you sometime in the future. My husband and I loved Santa Fe and the surrounding areas but loved coming home to this wonderful casita. It is so close to everything yet you feel like you are very secluded. The views from the deck are amazing! We were able to meet Bill the owner and he seemed like he truly cared about his guests but was not intrusive at all. We would definitely stay here again! Thanks for the kind words and for putting up with all the hassles from the main house renovation. Hope to see you again in the hot too distant future. Wonderful location close to Santa Fe. Beautiful view and comfortable home. Loved the art throughout the home, big picture windows, kivas, nice patio to relax after a day of shopping and sightseeing. Bill is very accommodating and wants to make you feel welcome. Loved our stay. Thanks guys, really appreciate the kind words. Oh, sink is fixed sorry I couldn't get the plumber in sooner. The other reviews say it all...beautiful views, minutes from downtown, gorgeous home. I’ll just say. You are in for a treat!! Enjoy! Thank you very much for the kind words. Hope to see you again. Very peaceful environment.......a quiet retreat with wonderful views of the valley. Arriving from Phoenix, we loved the cool evenings and sleeping with the doors and windows open. Easy drive to downtown Santa Fe; an abundance of eating establishments, shopping, and historic buildings. Historical museum of New Mexico is very interesting. Look forward to seeing you both some time in the future. Tesuque Village Market, El Nido, Santa Fe Opera, Shidoni Foundation and Sculpture Garden, National Forest, nearby Pueblos. 2 children under 16 at no additional charge. Rates are subject to change until reservation is confirmed. Promotional Rates may apply for certain time periods. Contact us with special requests.